.Never judge a book by its ‘ movie,’ J. W. Eagan once asserted. Yet, as I regarded Celestion’s compact and affordable Style series surround speaker system, I couldn’t help feeling disappointed. “Hmmpff” I grumbled to myself, “com pact and stylish—I’m going to hate it.” As I’m noted for the consistency of my predictions, I should have known what to expect from this one—after all, I’m the guy who prognosticated that CD would never catch on because people would be intimidated by all that technology. Even so, I was stunned by how practical and effective I found the Celestion system. The Celestion Style series consists of four offerings divided into two categories: Soundstyle and Cinemastyle. The sole offering of the Soundstyle series is the MP1, which is intended for use in home-theater systems as a L/R (and sometimes, center or surround) speaker, but is also aimed at consumers looking for computer, remote location, or—given their weather-resistant finish—outdoor loudspeakers. At 90 dB efficiency, they could conceivably be run straight of a soundcard, but are probably intended to mate with low-powered, affordable receivers. Jack English reviewed the MP1s in Stereophile (Vol. 18, No. 6) and found a lot there to like; although, as stand-alone speakers, he found them a tad lightweight for music-only applications. The speakers are unusual looking. Wedge-shaped in cross section, with enclosures comprised of gray polypropylene, they sit on a “universal stand”— a swoosh-shaped base resembling the Federation logo from Star Trek, with a 3-inch metal bar that can be attached to the speaker in a variety of ways. 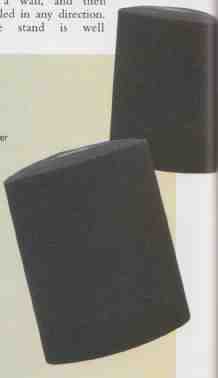 Thus equipped, the speaker can be mounted on a flat surface or a wall, and then angled in any direction. The stand is well thought-out and practical. In my listening sessions, I placed the MP1s on the bookshelves that flank my monitor. The Cinemastyle series encompasses the rest of the units of this system. The Centre2, like most dedicated center-channel speakers, arranges its drivers in a quasi D’Appolito configuration (tweeter between matched midrange/ woofers), which emulates a point source. 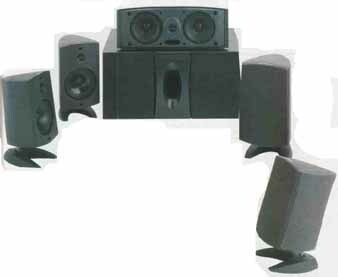 The speaker is designed to rest on top of your video monitor (or, conceivably, just below it), and comes equipped with several extra rubber feet of different heights used to angle its front panel directly at the listeners. The Little is are shallow, with a curved faceplate. Like the MP1s, they come with integral stands that allow them to be placed on flat surfaces or mounted on a wall. I wall-mounted them above ear level. The CSW subwoofer was designed to offer a variety of placement options, including on its side and beneath the monitor. It has an adjustable low-pass filter, which helps it blend seamlessly with the L/R speakers. I found that this control needed to be set toward the upper end of its range to work best with the MP1s, which do not have much output below 120 Hz. I tried several positions before determining that the sub sounded best when using a wall for reinforcement. This had the added benefit of allowing me to position the subwoofer behind my equipment rack, freeing up floor space and making the room seem less cluttered. The downside to this placement was that the unit, while video shielded, does not seem particularly well-shielded in the audio sense. I had to be quite careful how I routed my cables, or the system had a pronounced 60-cycle hum. This was difficult to trace, because I initially blamed my cable system and tried several methods of ground blocking before I aligned all signal-carrying wires more carefully. My current video room is relatively small (12 feet W by 10 feet L by 8 feet H), which is probably the sort of chamber the Soundstyle components were designed for. My home-theater system is centered around a Rotel RSP960AX surround processor feeding a Rotel RB956AX 6-channel amplifier (only five channels being required here). LD and CD playback was accomplished with a Marantz LV510, using the Sonic Frontiers Ultra Jitterbug and Assemblage DAC 1 to improve audio playback. A Marantz MV610 HiFi VCR took care of time shifting and videotape playback duties. A Transparent Cable Power Link Reference HPAV line filter really (I mean REALLY) cleaned up the AC garbage that so profoundly affects video and audio signals. MIT’s ISO-LinQ cable effectively decoupled the sys t e m ‘ 5 ground from that of my cable provider; this improved the sound of my whole system, even if my hum problem wasn’t caused by this common ailment. It also improved the video quality of the signal, eliminating all but the most egregious ghosting (for some reason ABC’s picture quality is terrible through this carrier). The interconnects included Straightwire Symphony; speaker cables were Straightwire Quartet. Setting up the system was surprisingly straightforward. I drilled two holes into the sheetrock on either side of my listening room—about seven feet from the floor—tapped in a couple of wall-anchors, and screwed the mounts for the Little is to the walls. Attaching the speakers was a snap: one Phillips- head screw (provided) tightens each of the Little is to the hardware. While this seemed adequately secure, I’m a belt and suspenders kind of a guy, so I used Velcro tape to attach the top part of the speaker to the wall. This had the added advantage of curing the mild jiggle the speaker is prone to when attached at only one point. Other than placing the subwoofer, the only remaining trick was ensuring that the MP1s and the Centre2 were in the same plane—a process that the ingenious MP1 stand made quite simple. I installed the system just in time to watch the Beatles’ Anthology broad casts, and I was immediately caught up in how spacious-sounding and involving I found the whole event. One of the most basic precepts of the surround-sound ethos is how much it is supposed to expand the video experience—to take it out of the little (or even not-so-little) box. I would have to consider the Soundstyle system a rousing success in that regard, especially given its modest price. I spent most of that weekend glued to the set as I watched video after video. My wife had never seen The Fugitive and even though I’d burned out a long time ago on the ubiquitous (at shows, any way) train wreck scene, I treated her to a screening. We were transported instantly into the world of Dr. Richard Kimble—courtesy of a lot of good Foley work. Differences between vast and cramped spaces were clearly articulated, dialog was centered at the screen, and effects took place in the environments we were inhabiting—not in those little speakers up on the wall. The train sequence was powerful—not as overwhelming as at Major Tom Norton’s house, but not as distorted and uninvolving as at most show demos, or even at the Brooklyn googolplex where I originally saw the film, for that matter. The helicopter scenes were overpowering; very loud and with sound seemingly coming from all around. I won’t pretend I took any notes that night. Quite frankly, neither of us was paying attention to the technology, we were both much too involved in the story. Used in smallish rooms, with attention paid to both subwoofer placement and integration with the primary speakers, the Soundstyle system is capable of immensely expanding the home-cinema experience. I tried a few substitutions during my audition, just to see if I could improve upon the basic configuration. I had an extra pair of MP1s, so, having noticed that pink noise changed character when cycling from tight to center to left, I replaced the Centre2 with one. The MPI is surprisingly sensitive for such a small speaker my B weighted measurement of 90 dB/W/m confirming the specification. Considering that its intended to be used with inexpensive receivers the Celestion’s impedance is relatively demanding dropping to lust 33 ohms in the lower midrange. The small port peaks up the woofers output very slightly in the 150 Hz region but the MPI does not have any true bass output to speak of Higher up in frequency the speakers balance is somewhat forward in the high midrange on the tweeter axis which is exacerbated by a lack of on axis energy in the crossover region Sitting with your ears slightly higher than the tweeter gives a more neutral perceived balance; sit much higher, however, or below the tweeter axis, and the MPI will sound rather hollow The top octave is slightly shelved down above 16 kHz what would normally be the tweeter s ultrasonic resonance peak is obscured by deep cancellation notches These are presumably due to the plastic plate in front of the diaphragm and fill in off axis The sweeter offers very wide dispersion in the bottom octave of its passband which might make the speaker sound rather bright in under damped rooms The Celestion a cumulative spectral decay or waterfall plot was surprisingly clean in the low and raid treble However the tweeter resonance at 16 kHz is lust low enough to be audible Resonant behavior could also be seen in the upper midrange, which might be audible as sibilance. The MPI stand allowed me to focus the speaker directly at my listening position, and the pink noise sounded better (or at any rate, the same as the L and R channels). However, I found the sound too speaker-specific, especially if I sat off axis to it. Rather than centering the sounds at the set, as the Centre2 had done, the MP1s located sounds in the speaker itself, which I found distracting. Back to the Centre2. What if I replaced the Little 1’s with MPIs, would there be any benefit to that? Not really, it turns out. Not a hundred bucks worth at any rate. Finding the Soundstyle system so satisfying in expanding the theatrical experience, I was curious about its suit ability for musical reproduction. In the context of a small room, a compelling argument can be made for using multichannel playback to expand the perceived spaciousness of recordings. I had the perfect candidate at hand, the DMP Big Band’s Carved In Stone (CD 512)—a disc recorded using the Circle Surround process. I found the recording unusually spacious sounding, but otherwise not terribly involving. Hey Larry, you’re talking to the man accused of never meeting a little speaker he didn’t like! I did not find the MP1s used on their own (no surprise there), or even in the context of the complete Soundstyle system, competitive with very fine $1,000/pr speaker systems such as the Alon Petites or the Monitor Audio Studio 2s. Those who value the sense of being surrounded by the music more than they do its innate cohesiveness may disagree with me. “Like you were?” she jibed. But, you see, for all intents and purposes, for those two hours, I was. I really was there.